Dublin-born singer-songwriter Marc Carroll’s latest album, Love Is All or Love Is Not At All, is his most political record yet. A collection of songs that ruminate on how love can triumph over adversity, it includes haunting, atmospheric ballads, a spoken word collaboration with Crass’s Penny Rimbaud and joyous, jangly power-pop. I’m really enjoying the new album. Several of the tracks are protest songs – the opener No Hallelujah Here is about four young boys who were killed while playing football on a beach in Gaza last year, while Ball and Chain is a call for unity and harmony in the world. Why did it feel the right time to make a record with a more political message than some of your previous albums? Marc Carroll: I think at the moment there is a sense of possibility for change – a telling of truth to power. This is going on all over the world. People everywhere are saying enough is enough. This record is of its time and that hope and sense of protest is the zeitgeist of the time. Recent events in the British political system also reflect this. I believe the tide is possibly turning and the few may well become the many. Like all sane people, I was horrified by the killing of those little boys. I could barely move for several days. but we must remember that it is not an isolated incident. This happens to men, women and children all over the world on a daily basis – we just don’t see it and the media certainly don’t report it. But I don’t equate politics with empathy, and essentially, this record – and some of the songs – is a calling for empathy and compassion. From the title track, to some of the other lyrics on the album, it feels like you’re trying to say that love can conquer all – it can overcome adversity. This feels like a positive, hopeful record. Would you agree? How did you approach this album? What frame of mind were you in when you wrote it? MC: The title of the song and the album is almost a blanket of protection. Who would possibly argue against it? I certainly hope it is perceived as a positive record, but we live in very cynical times. I suspect any negativity aimed at this record will inevitably reflect back on the critic, so they should choose their words very carefully. I approached this record like it would be my last. As for the frame of mind I was in, well, it was the same frame of mind I always have when I make a record – is it any good? Will anyone listen? Will anyone care? But those concerns were duly trumped when I realised that does it actually matter. Is there a cure for cancer? There are some very atmospheric, haunting and widescreen/ panoramic songs on the record – it has a big, epic sound in places. What were you aiming for with tracks like No Hallelujah Here and Oh, Death, Don’t Yet Call Me Home? MC: That panoramic, almost filmic, quality came naturally to many of the songs. I love drones and other atmospherics in any music. I am particularly drawn to the music of Florian Fricke from Popol Vuh – imaginative soundscapes. That was something of a conscious approach to the record. Apart from that, I’m never sure of what I want to hear when I record my songs, but I do have a relatively good idea of what I don’t want to hear. I really don’t plan anything out or have a grand plan of how things should be. The songs themselves dictate the way forward. Both the songs you mention were sung in one take. I knew what they were about and how they should be expressed. The music and title for No Hallelujah Here actually goes back to 2005 for the World On A Wire album, but only realised itself as an actual song of substance with this new record. MC: Being Irish and using a minor chord every now and then means I am never far from the aesthetics of that music whatever actual style the song might be. I have a strong, and natural, gravitation towards melancholy. It’s a very big part of the Irish DNA. Although I don’t think melancholy is specifically an Irish trait. MC: Ball and Chain was page after page of dialogue with myself. The lyrics simply followed the melody, which to me anyway, seemed very uplifting, and I wanted the words to reflect that and I believe they do. They came from a very internal place because I don’t watch the television or read the daily horror from the print media. Lost and Lonely – that’s simply back to the previous melancholic reference, but minus the minor chords. To be honest, I had never heard of the term ‘power- pop’ until quite recently. It always confused me as to why I would be associated with it. I’m still not sure. Is it powerful pop? Jody Stephens from Big Star plays drums on Lost and Lonely. How was it working with him? Like me, are you a huge Big Star fan? Did they influence you – especially early on in your career, with your band The Hormones? MC: Jody is a lovely man. I met him at the opening of the Big Star documentary in Los Angeles a few years ago. It was one song that I thought he would be perfect for, and, of course, he was. I have always loved Big Star and I suppose their influence comes through on several songs over the years. Let’s talk about the title track of the new record, which is a departure for you. It features a spoken word part from Penny Rimbaud of the punk band Crass. How did you come to work with him? Are you a Crass fan? MC: It started off as an instrumental piece, which is something I do every now and then. I’d actually like to make an instrumental record. I’ve known Crass for 30 years of my life. They were – and still are – a huge influence on the minds of millions of people around the world, including mine. I asked Penny would he like to contribute to the record and maybe read one of his poems over the piece of music. He agreed and he delivered something spectacularly beautiful. He is one of the great poets and writers of our time and one day will be recognised for that I am certain. Gee Vaucher [Crass designer] also designed the artwork for the album. They are very kind, generous, warm-hearted people to be around and I love them dearly. In the early days, you used to play in punk bands in Dublin? What you can remember about those times? MC: Punk is the best place to start. What was the writing and recording process for the new album like? Where did you make it and did you have all the songs written before you entered the studio? MC: The writing process is as it always has been – part joy, part anxiety but mainly mind-crushing frustration. The recording process was initially problematic – the record was recorded twice. The first sessions in Los Angeles ended up sounding like some dreadful American FM dirge. It was recorded by somebody whose only cultural reference was that fool, Howard Stern. All I heard were things like ‘Hell yeah, Pink Floyd, dude’. Needless to say, his services were no longer required. In the end, you co-produced the album with Graham Sutton (Bark Psychosis, These New Puritans). How was that? MC: Graham mixed a record of mine back in 2009 and he was the first person I called when things went so badly wrong in America. 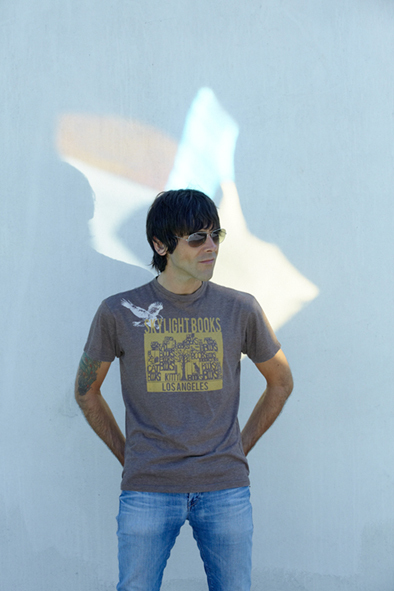 Graham is the type of producer/musician that wants to help you make the record you want to make, as opposed to thinking it is his record, his vision and his opinion that counts. That is the problem with most so called ‘record producers’. How could any of these people possibly know more about the songs than the person who wrote them? Having said that, I care only about serving the songs. There are guest appearances on the record from drummer Pete Thomas (The Attractions), jazz trumpeter Noel Langley (Bill Fay) and keyboardist Bo Koster (My Morning Jacket), who played on your last album. How did these collaborations come about? MC: Again, I try and work with people that I think will serve the songs. Pete could provide that full on, powerful repetition and machine gun precision that was essential for Ball and Chain. He was in Los Angeles when I started this record, so the schedules worked out. Bo is someone I worked with before – a good fellow. I wanted the keyboards to have the sensitive, melancholic quality that he provides. Working with Noel was most fortuitous. I heard some of his work on the recent Bill Fay record, which I love, and knew it was the sound we were looking for on the particular songs. He was fun to work with, very creative and completely understood what was needed for the songs he played on. You now live in L.A. Do you like it there? Do you miss the UK? 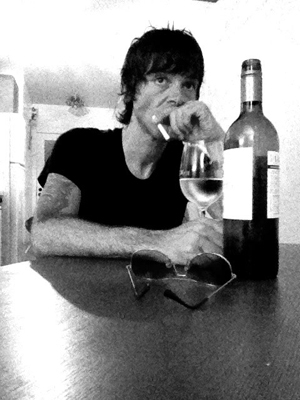 MC: I have spent the majority of my time – the last seven years anyway – in Los Angeles. It’s full of narcissistic, self-obsessed, dangerous, psychotic lunatics, and that’s just the police! MC: I don’t think about it too much to be honest. It’s what I do and I feel no different about this record coming out than any of the previous one…other than time to move on. Throughout your career, you’ve had great critical acclaim, but not broken through into the mainstream? Why do you think that is? Does it bother you? MC: I don’t really look at music or creativity in that way. I removed myself from the industry of music a long time ago. There are some very good people in it, but most operate in a way I can’t relate to. I like to communicate with people, not the business of people … hence, perhaps, my anonymity. The music on the other hand, speaks for itself. I first came across you in The Hormones, back in the late ‘90s. Do you have fond memories of those days? Any good stories? MC: We toured a lot – the Japanese loved it. And, finally, Marc: what is love? MC: Something that defies ownership. 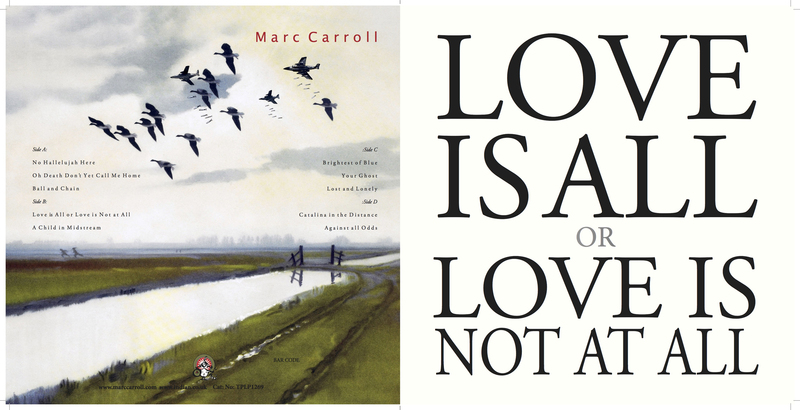 Marc Carroll’s new album, Love Is All or Love Is Not At All, is released on One Little Indian on November 6.